Services - Lynn Whitsett Corporation, refractory services, Memphis, TN area. 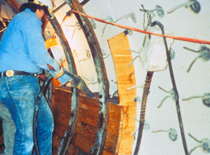 Lynn Whitsett Corporation has a full range of capabilities for supplying a quality, on time, refractory installation for the industries we serve. Due to several different branch offices and/or warehouses, we have the materials, equipment and manpower to effectively handle any refractory needs, whether scheduled maintenance or an unexpected or emergency repair. Lynn Whitsett excels at being able to mobilize quickly for those inevitable, emergency requirements. Our team of technically skilled personnel offers the highest quality and performance on every project. © 2019 Lynn Whitsett Corporation, All Rights Reserved.